Evo & Grace: The WanderLusts: Introducing “Kapitan Kalikasan”, the new age Superhero from Palawan. Introducing “Kapitan Kalikasan”, the new age Superhero from Palawan. The cast and crew of "Kapitan Kalikasan". Before 2016 ends, the resident and home grown studio of Film maker Dante Nico Garcia that is based in Puerto Princesa City this past years, introduce his latest creations via a multi media film series called “Kapitan Kalikasan” under the direction of his protégée Rocky Austria-Pagliawan. 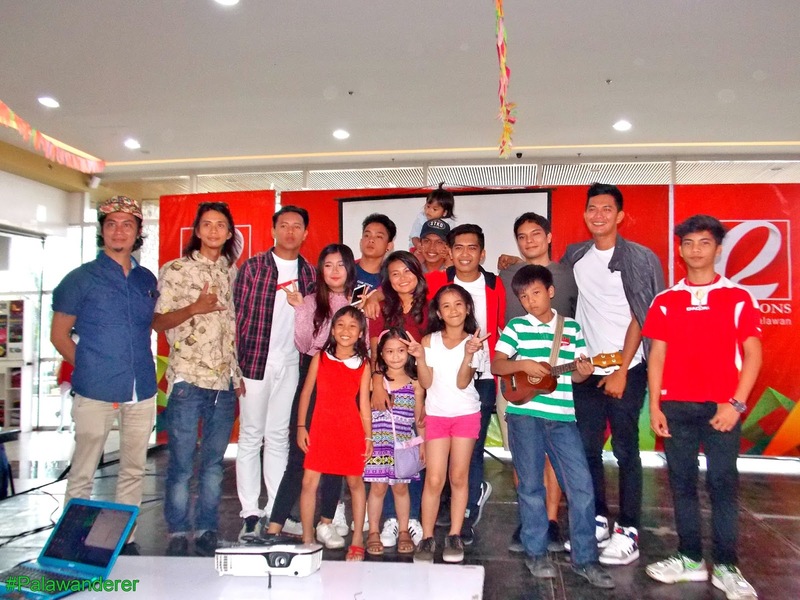 The premiere held at Robinson Mall Palawan last Dec 24, wherein the almost 17minute film give a glimpse of what to expect on this new age super hero that is task in saving the environment, making things clean and creating a better place for everyone. It open with a 3minute animation featuring a kid opposing a soon to be enemy, and the introduction of his power courtesy of a mystical and talking grasshopper. Kapitan Kalikasan top billed Quatro Tagapulot and a lot more of young Palawan’s upcoming talents, all products of Garcia’s workshop under Life College. The opening teaser features scenic and ideal products of Puerto Princesa, a group of teenage guys discussing the benefits of home grown honey while dealing with hugot lines from the film Ploning, and two kids who deeply talk about love and trying to understand its circumstances. The teaser however didn’t provide much clue on the main story, the establishing of its main characters are not all clear, and how they will connect to each other. One confusing plot is the mala-fairy love angle that was supposed to be told by one of those guys hanging out in a bar. The closing part is much more interesting since the all new animated Kapitan Kalikasan goes out of the Underground River, while two more clue from a blacksmith and lady kid is shown before the end credits start. Garcia when ask, inform us that the said teaser is just a start of a big project being cook, Kapitan Kalikasan is originally plan as a theatre musical that will open on April 30 of 2018 that hopefully will be destination itsel in Palawan . But for now a teaser is uploaded and it will be a series, via all social media forms such as Instagram, Facebook and Youtube. The second instalment is due to be released worldwide via free streaming this coming Black Saturday of Lenten season, and the third is on July 7 in time for the Let The River Rest event of Isda Revolution, while the fourth series is scheduled in the traditional December affair of Garcia’s Ploning anniversary. Show buyers and tickets for the staging of the musical will be out soon, for details pls contact Isda Revolution and Direk Garcia via social media or like their page https://www.facebook.com/FilipiNow/ and https://www.facebook.com/KapitanKalikasan/?fref=nf. Here is full opening teaser.